The ZP530 will be featuring a MediaTek SoC, the MT6732. It will utilize the four cores, clocked at 1.5GHz, as well as the integrated Mali-T760MP2 GPU. The RAM storage is set at 1GB while internal storage is 16GB. Given the trend of 2GB RAM in recent phones, budget phones included, the 1GB is a bit disappointing and may be a deal-breaker for some users. The screen is sized at 5.0 inches and is said to feature a 2.5D arc glass, giving the ZP530 certain edge. The display implemented beneath it has a 720p resolution display, and will be utilizing an IPS on-cell technology. The primary camera is specced at 8MP while the front-facing shooter has a 5MP sensor. On the connectivity front, Zopo is sticking with the GLONASS trend they started, implementing it alongside standard GPS/ AGPS. For network support, the ZP530 has GSM, WCDMA, and FDD-LTE capability. 4G frequency bands supported include 800/1800/2600 MHz, while 3G is 900/1900/2100. It is a very odd choice for them to leave out the 850 MHz, instead of going all out to make it worldwide-3G compatible. Finally, the slick looking phone will be running on a 2100 mAH battery. Considering the use of the on-cell display, it would have been easy to add a bit more to the battery size without fattening the phone too much. 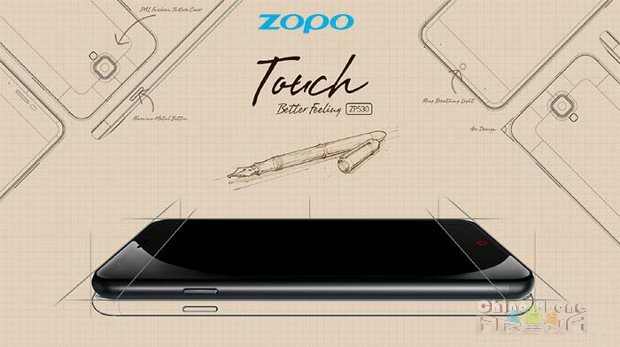 Unfortunately, Zopo let go of the opportunity and settled for a smallish battery. Thoughts on the ZP530? Do the refreshing features outweigh the average RAM, battery, and not-quite-worldwide 3G?